Department. Selection for these Asst Veterinary Officer Jobs will be held through MP VYAPAM Online written Exam. There are total 215 vacancies available in this MP VYAPAM recruitment. 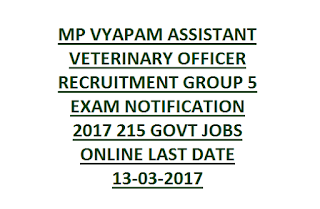 Are you having eligibility criteria to apply these Veterinary Asst jobs then you are eligible to apply for MP Vyapam Group 5 Vacancies recruitment. Online applications only received through official website of MPPEB www.peb.mponline.gov.in. Applications will not be accepted after 13-03-2017. So, try to submit the application before the closing date itself. 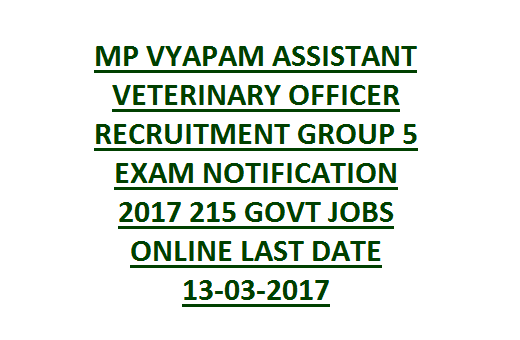 Complete details such as exam syllabus, available vacancies category wise, required qualification details and more info is given below for MP Vyapam Assistant Veterinary Officer Recruitment of Group 5 Posts. Click here to see the official notice of MPPEB Asst Veterinary Officer Jobs Recruitment. Candidate must have completed 2 years diploma in Animal Husbandry from any recognized university. For Male candidates of General Category upper age limit is 40 years and for all other category candidates including female upper age limit is 45 years. Candidates belongs other than Maharashtra for them upper age limit is 35 years. Selection for this MP VYAPAM Assistant Veterinary Officer recruitment will be through common objective type written test only. Written test will be conducted for 100 marks. 25 Marks for General Studies and 75 marks for Veterinary subject. Rs.500/- for General candidates of MP and other states. And Rs.250/- for reserved candidates of MP State. Apply online @vyapam.nic.in or PEB.mponline.gov.in on or before 13-03-2017. Click here to apply online for the MPPEB Assistant Veterinary Officer Jobs Recruitment 2017.